Something doesn’t quite add up about genetically modified (GM) foods. “Now that soy is genetically engineered,” warns Ohio allergist Dr. John Boyles, “it is so dangerous that I tell people never to eat it.” How dangerous are GM foods? World renowned biologist Pushpa M. Bhargava, PhD, believes they are the major reason for the recent rise in serious illnesses in the US. GM crops were widely introduced in 1996. Within nine years, the incidence of people in the US with three or more chronic diseases nearly doubled—from 7% to 13%. Visits to the emergency room due to allergies doubled from 1997 to 2002. And overall food related illnesses doubled from 1994 to 2001, according to the Centers for Disease Control. Obesity, diabetes, gastrointestinal disorders, and autism are also among the conditions that are skyrocketing in the US. The Lyme Induced Autism Foundation, a patient advocacy group, is not waiting for studies to prove that GMOs cause or worsen Lyme, autism, and the many other diseases on the rise since gene-spliced foods were introduced. Like AAEM, the LIA Foundation says there is more than enough evidence of harm in animal feeding studies for them to “urge doctors to prescribe non-GMO diets” and for “individuals, especially those with autism, Lyme disease, and associated conditions, to avoid” GM foods. Another patient group, those suffering from eosinophilia myalgia syndrome (EMS), is more confident about the GMO origins of their particular disease. It was caused by a genetically engineered brand of a food supplement called L-tryptophan in the late 1980s. It killed about 100 Americans and caused 5,000-10,000 people to fall sick or become permanently disabled. The characteristics of EMS made it much easier for authorities to identify the epidemic and its cause. It only affected those who consumed the pills; symptoms came on almost immediately; and its effects were horrific—including unbearable pain and paralysis. There was even a unique, easy-to-measure change in the white blood cell count. But even though EMS was practically screaming to be discovered, it still took the medical community more than four years—and it was almost missed. “The experiments simply haven’t been done and we now have become the guinea pigs.” David Suzuki, renowned Canadian geneticist. What if the GMOs throughout our food supply are creating common diseases which come on slowly? It would be nearly impossible to confirm them as the cause. “Physicians are probably seeing the effects in their patients,” says AAEM president Dr. Jennifer Armstrong, “but need to know how to ask the right questions.” The patients at greatest risk are the very young. “Children are the most likely to be adversely effected by toxins and other dietary problems” related to GM foods, says Dr. Schubert. They become “the experimental animals,” our collective canaries in the coal mine. Scientists at the Food and Drug Administration (FDA) had warned about all these problems back in the early 1990s. According to secret documents made public from a lawsuit, the scientific consensus at the agency was that GM foods were inherently dangerous, and might create hard-to-detect allergies, poisons, new “super” diseases, and nutritional problems. They urged their superiors to require rigorous long-term tests. But the White House had ordered the agency to promote biotechnology and the FDA responded by recruiting Michael Taylor, Monsanto’s former attorney, to head up the formation of GMO policy. That policy, which is in effect today, denies knowledge of the scientists’ concerns and declares that no safety studies on GMOs are required. It is up to Monsanto and the other biotech companies—who have a long history of lying about the toxicity of their earlier products—to determine if their own foods are safe. After overseeing GMO policy at the FDA, Mr. Taylor worked on GMO issues at the USDA, and then later became Monsanto’s vice president. In the summer of 2009, he went through the revolving door again. Taylor was appointed by the Obama administration as the de facto US food safety czar at the FDA. It wouldn’t take a majority of us to kick GMOs out of our food supply. Kraft and other food companies wouldn’t wait until half their market share is gone before telling their suppliers to switch to the non-GM corn, soy, etc. By using GM ingredients, they don’t offer customers a single advantage. The food doesn’t taste better, last longer, or have more nutrients. Thus, if even a tiny percentage of US consumers—say 5% or 15 million people—started avoiding GMO brands, the millions in lost sales revenue would likely force brands to remove all GM ingredients, like they already have in Europe. But the FDA doesn’t want to give us the choice. They ignore the wishes of nine out of ten Americans for mandatory GMO labeling in order to promote the economic interests of just five biotech companies. Genetically modified (GM) foods have not been scientifically tested on human beings. (The only published human feeding study had ominous results – see later.) Instead, animals are used as our surrogates, but the few published animal safety studies are generally short-term and superficial. In fact, industry-funded research is widely criticized as designed to avoid finding problems. They’ve got bad science—down to a science. Even still, the accumulated evidence of harm is compelling people to read ingredient labels and avoid brands with genetically modified organisms (GMOs). 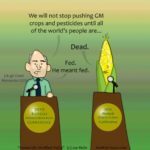 You uncovered so much of the GMO story with thorough research and I really enjoyed reading your post. Say no GMO!